Vintage Runs in the Family | Oh, for the Love of Vintage! In the 90s, my mother had an antique shop (Baubles Antiques) in our home that specialized in vintage clothing and jewellery. I kick myself now for not taking full advantage of the amazing items she had in the store. Apparently, as a teen, I was more preoccupied with other matters (Dr. Martens, Alice in Chains and plaid) besides vintage clothing and jewellery. What on earth was wrong with me? Having said that, I actually do still have some vintage pieces that were given to me back then. One particular item comes to mind, a 1930s silk pajama top with moons and stars on it. To this day, over 20 years later, I still wear that PJ top as a shirt! However, vintage running in the family doesn’t stop there. 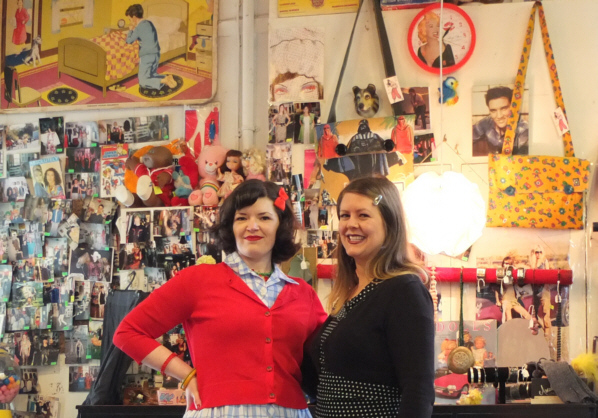 My brother and sister-in-law own a cool retro shop in my hometown, Retro Runway Fashions. 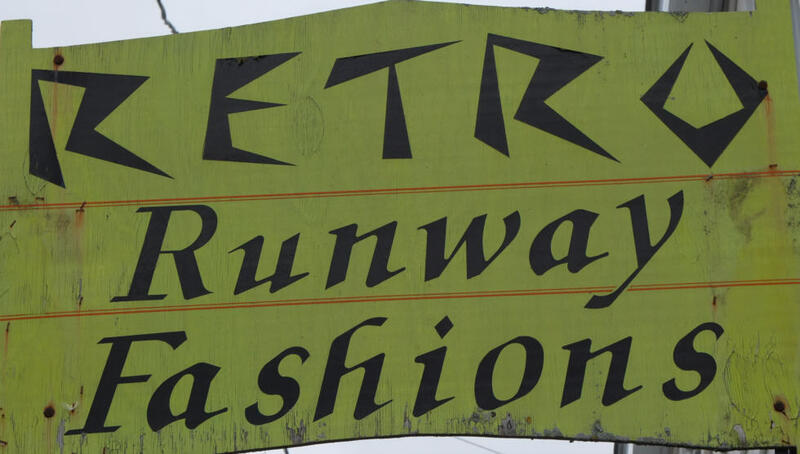 The stock is amazing and includes men’s and women’s fashions and accessories from the 40s up to the 80s. My sister-in-law, Julie, also makes her own line of products including wrap around sweaters, pants and skirts as well as purses and wallets. 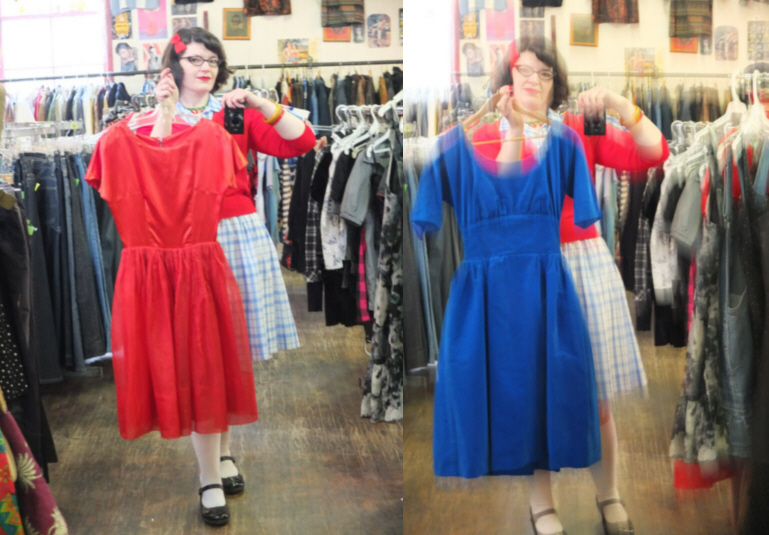 Below are two lovely early 60s dresses in my sister’s shop that I just had to share with you. Unfortunately, these dresses are way too small for me. Yet another thing that runs in the family, curves! ;0 Sometimes life just isn’t fair introduces you to pretty frocks you simply can’t have. Evil Tauntress! 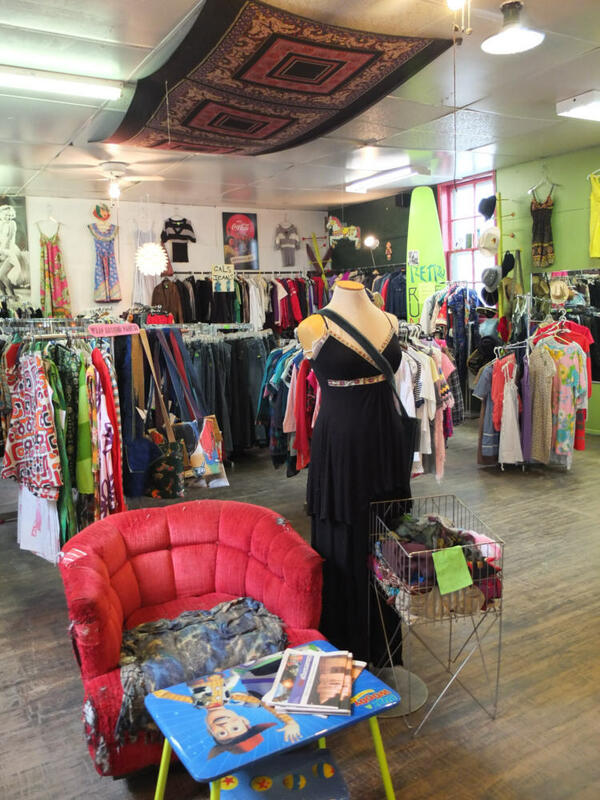 If you’re ever visiting Nova Scotia do make the trip to Wolfville to visit Retro Runway Fashions (2 Central Ave., Wolfville). I’m certain you’ll find your own treasures there! Is it to late to be adopted? Great pictures, love the day dress on you!! 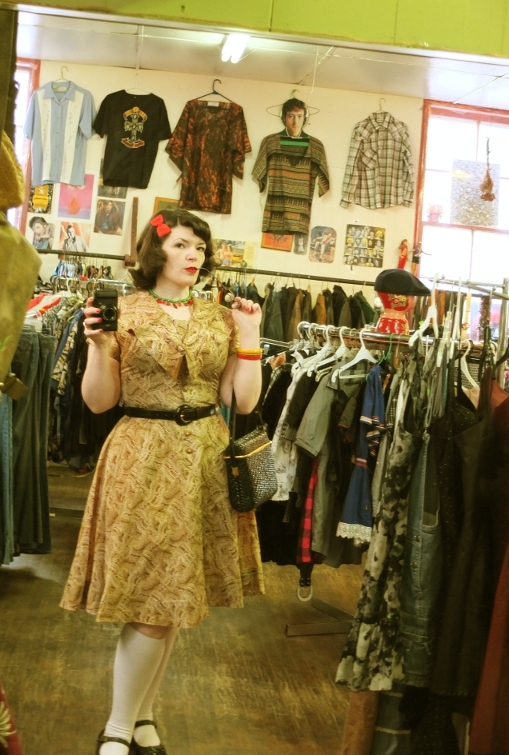 That shop looks lovely… I wish I had someone in my family who understands; mine all want me to dress normally! Pingback: Vrrroooom! Vintage Runs in the Family Part II « Oh, for the Love of Vintage! « Oh, for the Love of….Lady Head Vases!